Last week on Thursday Night Football, we were subjected to Matt Moore vs. Joe Flacco, and the Ravens won an incredibly boring game 40-0. This week, it's Tyrod Taylor vs. Josh McCown, two QBs who probably won't be on their current teams come 2018. And I fully expect Bills-Jets to be rather bland as well. But, you can bet on it, and baseball season will be over, so here we are (I'll be watching Warriors-Spurs). Both the AFC East and state rivals have surprised most prognosticators. The Bills (5-2) opened the season with a win total set at 6 at most sportsbooks, and they can match that number with a win on Thursday while tying the Patriots for first in the AFC East. The last time Buffalo won a division title in 1995, it still had future Hall of Famers like Jim Kelly, Thurman Thomas and Bruce Smith at the tail end of their careers. Of course, the Bills haven't made the playoffs since 1999, which is the longest current drought in all four major U.S. professional sports leagues. Next is MLB's Mariners, who haven't made the postseason since 2001. In the NBA, it's Minnesota (2003-04 season) and NHL it's Carolina (2008-09). I don't give the Bills any realistic shot to win the AFC East (barring a Tom Brady injury) as they are +700 and New England -2000. A wild-card spot is possible, though, as long as that defense keeps playing at a high level and running back LeSean McCoy stays healthy. If Buffalo were to win here and could split its next four - vs. New Orleans, at LA Chargers, at Kansas City, vs. New England - then it has a shot. Sean McDermott will get some Coach of the Year consideration, although the Rams' Sean McVay is the guy to beat right now. The Jets (3-5) probably have already lost any chance of getting the No. 1 overall pick in the 2018 draft - who would have thought the Giants might have a better pick in that than the Jets? While the Jets have been admirably competitive, it's not going to save the job of Coach Todd Bowles. I can see the Jets losing out because they likely won't be favored once the rest of the way. A 3-13 mark could be bad enough to get the No. 3 overall pick as I'm assuming the Browns and 49ers will pick 1-2 in whatever form. Jets fans better hope the rumors that USC quarterback Sam Darnold is planning to return to school next year are false, though. McDermott, the former Panthers defensive coordinator, has made an immediate impact on this franchise - he has traded away some big-money malcontents like WR Sammy Watkins and, last week, former Pro Bowl defensive tackle Marcell Dareus - and on that defense. The Bills are a bend-but-don't break group on that side of the ball, ranking middle of the pack in yards allowed but surrendering only 16.4 points per game. The only team to top 20 against Buffalo was Tampa Bay in a Week 7 loss. Buffalo comes off a 34-14 win over the Raiders on Sunday. McDermott asks Taylor to simply manage the game and he did, throwing for 165 yards and a TD with no turnovers while also rushing for a score. McCoy is by far the team's most important offensive player and he rushed for a season-high 151 yards and a TD on 27 carries. I really don't understand why opponents don't just play man defense on Buffalo's terrible group of receivers and sell out to stop the run. The Raiders had 367 yards of offense (bend) but gave it away four times (don't break). The Bills played without three injured defensive starters but lead the NFL with a plus-14 turnover margin. It is the highest turnover margin through seven games since the 2005 Bengals, who were plus-16. The Jets are quite good through three quarters in games but then they implode - getting outscored 76-20 in the fourth. They have blown leads in all three of their three-game skid. New York was up 14 in the fourth two weeks ago in Miami and 17-16 entering the fourth Sunday at home in a monsoon against Atlanta. The Falcons won 25-20. New York's special teams lost that game with a muffed punt at its own 13 in the fourth quarter and two Chandler Catanzaro missed field goals in four attempts. In a great social media moment late that night, Ross Martin, who lost out to Catanzaro in a training-camp battle, posted a video on Twitter that showed him making three straight field goals from 50 yards in the rain at a park in Manhattan. Martin said he wasn't trolling Catanzaro. Yeah right. After the game, Matt Forte ripped the offensive play-calling in the conditions, saying the team should have run the ball more. The Jets ran 22 times, compared to 36 dropbacks for McCown, who passed for 257 yards and two touchdowns. First-year OC John Morton is the play-caller. He spent the past two seasons as the receivers coach for the New Orleans Saints. With the NFL trade deadline on Tuesday, it wouldn't surprise me if the Jets sent out a veteran or two (Forte potentially one of them) for draft picks. 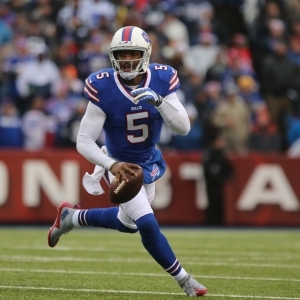 At 5Dimes , Buffalo is a 3-point favorite (-115) with a total of 43. On the moneyline, the Bills are -165 and Jets +145. On the alternate lines, Buffalo is -3.5 (+115) and -2.5 (-140). The Bills are 5-1-1 against the spread (2-1 on road) and 3-4 "over/under" (0-3 on road). The Jets are 5-2-1 ATS (4-0 at home) and 4-4 O/U (2-2 at home). The Bills are 4-1 ATS in their past five after a win. The Jets are 2-7 ATS in their past nine in November. The under is 11-5 in Buffalo's previous 16 in November. The under is 5-1 in the Jets' past six vs. the AFC East. The under is 5-1 in the past six meetings. The Bill have covered six of the previous eight. The Jets swept the Bills last year, but in Week 1 this season Buffalo won 21-12, holding New York to 214 yards and 11 first downs while picking McCown off twice. The Bills rushed 54 times for 190 yards. Taylor threw for two scores. I expect somewhat a similar score here. I'm not particularly fond of taking the Bills away from home considering they are 1-2 on the road, but they are simply better coached and should be able to win by a field goal. Give the 2.5 points and go under. Doc's Sports wants you to try out our stable of NFL handicappers absolutely free of charge. We know you'll be impressed, so access $60 worth of member's picks with no obligation. Get started today with one click . Also, get three handicappers for the price of one when you sign up for a full-season football package! Click Here for details . Get free NFL betting picks weekly on Doc's Sports free football picks page .